This is my second aircraft build since returning to modelling a couple of years ago. I liked the profile in Warpaint Special No 1 (Pg15) of LM-E picked up a s/h kit at Hendon. A little digging on http://www.littlefriends.co.uk/56thfg.php?action=list_records&recs=50&sort_order=ASC∨der_by=Squ&recs=50≠xt_page=7#tabletop showed an anomoly on the serial number as described in the book. 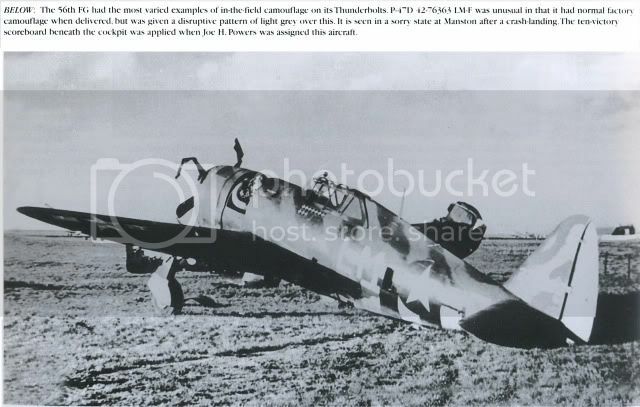 The plane is listed in the text as 275853 LM-E whilst the serial on the tail is drawn as 276363, which little friends lists as LM-F assigned to Lt Joseph Powers. Can any one clarify the situation as well as possible colours. Some of the threads would indicate the 62 FS were not adverse to a complete repaint unlike the illustration which implies a splash of medium sea grey over olive drab. I also chose this aircraft as I could make up the lettering myself. Little friends would seem to suggest nose-art as well! Any hoo any help/ideas would be appreciated. For colours your probably looking at RAF Dark Green and Ocean Grey top colours which was pretty much a standard ( if indeed there WAS a standard) marking for the 62nd FS aircraft around that time. Most evidence points to many of the undersides being painted in a grey colour. Possibly Medium Sea Grey, although some aircraft may have been left in bare metal on the underside. 4276363 was a D16, which would have been delivered in the Olive Drab/Neutral Grey scheme, so its possible that the underside may have been left in that colour. It's also possible that the grey was applied over the existing olive drab. Paint schemes for the 56th FG aircraft are many and varied which adds even more to its appeal for modellers of the P-47! Many thanks for the info guys. No excuses for not getting on now. Looking forward to seeing her come together! Your Thanks are appreciated also. I did not realize that I have decals for your subject. Here is Aeromaster's take on LM-F. I cannot see the black crew panel (on the decal sheet) in the photo. It also directly contradicts the the color profile I previously posted (different kill markings). Right chaps - ocean grey over olive drab with nuetral grey lowers it is then. I like that colour profile Rex. I am inclined to agree. I have a film clip of the 62nd FS taxing to takeoff position. I just reviewed it to be sure. There were quite a few painted a/c as well as a bunch of NMF ones. The painted ones resembled your subject. Littlefriends.co.uk has a screenshot (cleaned up compared to mine) of it. LM-A "Stalag Luft III I Wanted Wings" This one was definitely green(grey or gray). I did not see anything resembling Medium Green and faded Olive Drab (brown). Now this does not preclude Nigel from saving the day with a never heretofore photo. Having missed the campaign deadline - I dislocated my thumb in November playing hockey, I have slowly been working my may through the project. Many of the smaller parts are painted and assembled. I got the fuselage buttoned up having pre-painted the zinc chromate yellow 'Mr Colour Zinc chromate type 2' from their interior colours set. Primed with good old halfords grey primer. Gotta love tha stuff. Undersides Xtracolour 'Neutral Gray' - This looks quite light especially compared to colour profiles. I then painted the topside Humbrol 166 for that faded look having first pre-shaded. This looked quite good. I was quite pleased with the results (always those small niggles- like my olive drab being too faded the ocean grey obliterating the preshading - just an oppurtunity to try post shading). After painting the invasion stripes the insignia (from montex) were placed on. I had already position some masks before stripes were painted on. When they were removed I had a little set back as can be seen. Thats the progress so far - hopefully a couple more weeks will see the 'old gal' nailed together so to speak. Glad to hear the thumbs better. Shame about the paint lifting but with a bit of careful masking it'll all work out fine. Billy Edens "Timeless Voices" interview features on the homepage of the 56thFG website at the moment. Nige - Many thanks for that link. I watched it straight away. Whilst most aircraft have a story to tell I am 'well chuffed' Billy Edens flew this 'Jug'. Anyhoo I rubbed down and repainted the olive drab parts of the camo - micromesh lightly polished - (understatement I mean hardly touched) the xtracolour ocean grey - so didn't require repainting . Once complete this was then flatted of with xtracolour XDFF matt varnish. The undersides were reworked by sticking bits of tape in appropriate places and re-sprayed, I had also flatted off just one side underneath as an experiment with XDFF again. This side retained all its paint after de-masking. The other side lost one small segment of white - not too bad a result and perhaps something to remember. The top side had a brand new star and bar added from the one left over from the Montex sheet - success - all the paint stayed where it should. The two photos show the plane after the first coat of 'Klear' has gone on. Other detail work has been going on so we are now getting tantalisingly close. Parts below ready for a wash and decalling. So another couple of weeks..... hang on I feel a touch of the old deja vu. Just a few things to finish off / bits I've missed, ariel wire and landing lights. Still thinking of the best way to those. Thanks to all who have helped getting her this far. Looking very good Rossy and well worth the wait. I wouldn't worry about the ariel wire. Its extremely rare to see one on a P-47 in the ETO at that stage of the war as they were using different types of radio by then I believe. Certainly the later models didnt require ariel wires. ( M for instance). Wingtip lights.. I use regular white glue from the stationers. You only need a drop and it dries clear. Any access can be removed easily as well. Yes it does - it has saved me a job plus explains why so few lines are visible on later photos. White glue seems to have worked fine. I just to registered to kitmaker.net only to reply to this seven years old thread. This is probably not going to get any replies anytime soon, but I'm not in a burry. Though I did build some plastic model kits as a kid, on a very childish skill level compared to you guys, these days rc airplanes are my hobby. Unfortunately years ago I sold it on ebay, together with many other unbuilt kits. Might have to acquire one again. Also, this kit only adds to the confusion. According to it's painting instructions the bird is not supposed to have invasion stripes under the wings. But I think the kit designers may not have done too much research; the serial on the box art is wrong, the decal sheet includes neither nose art nor kill markings. Another thing: Do we even know for sure the two photographies of the belly landed plane show LM-F and not just some similar bird? I can't see the F on the fuselage and the serial is unreadable. What I like about this design: Camouflage pattern looks more interesting than simple olive drab. Invasion stripes. Some bright colors, good for visibility, but not too much. (Not a fan of too colorful parrots such as Tarheel Hal.) So I think I'd like to use this specimen as a template for my rc airplane, whenever that may be. Or a similar one. Pin-up Girl nose art would be very welcome. Do you guys have any new information, clearing-up the confusion? Pictures? Nose arts?